Cloud surfing over the SE U.S., with a transition to a lower altitude. A swarm of tiny tadpoles, like little darting polka dots in a runoff basin near the office parking lot, eat, swim and work to survive the shrinking puddle’s summer evaporation to make the transition to frogs. Each of these little ones were about three-quarters of an inch from tip to tail. A warning? A clue? A totem of some kind? For weeks the body of a doe had lain in a roadside ditch near a creek crossing. Then this scene appeared. Grisly, curious, inexplicable. Dog out for a ride in Cruz Bay, St. John, Virgin Islands. 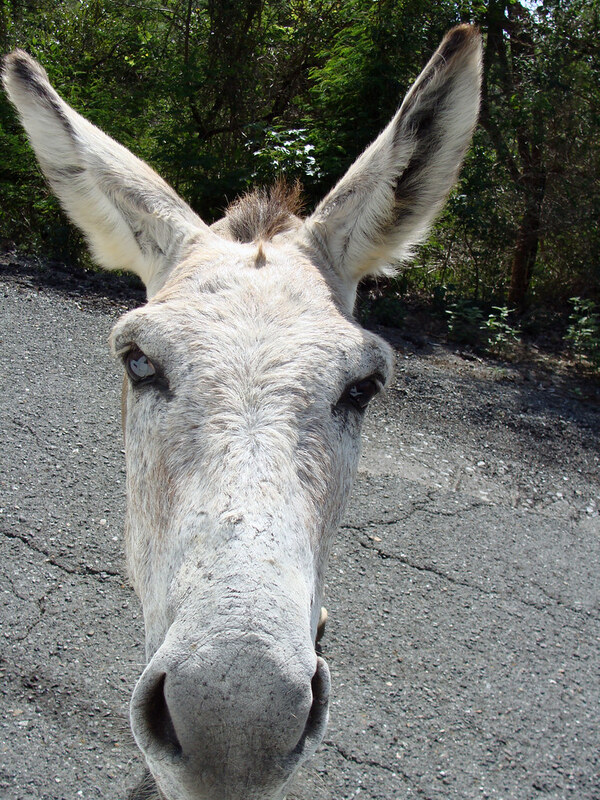 Feral donkeys on St. John aren’t shy about approaching tourists for treats. This one was the most forward of a small herd standing in the shade on the side of the road. Three’s company. Third time’s a charm. Three dog night. There’s no doubt the number three has a high profile in our culture and speech. 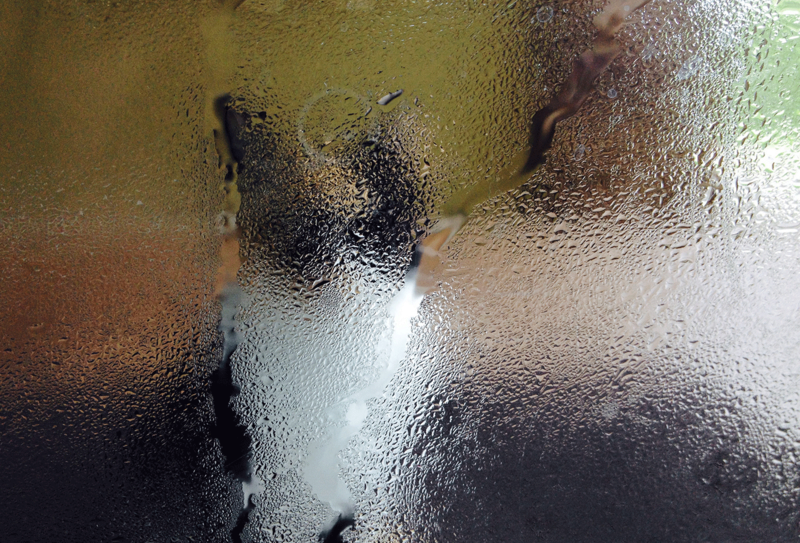 This week’s WordPress photo challenge is all about three: Trio. Below, a sea myrtle launches three seed parachutes into the breeze just below the lens flare. When it comes to airports, it seems only fitting that large-scale architecture get large-scale art. At least, that’s the thinking at Atlanta’s Hartsfield. Some may find these bits of public art a bit silly, but the child in me finds them absolutely delicious. 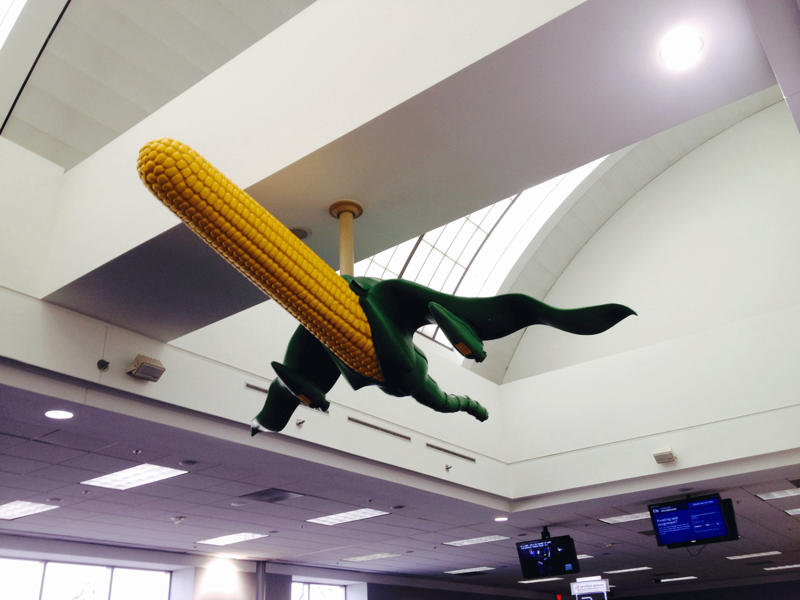 CORNAIR — Jet powered corn cob, ATL. Taken Oct. 24, 2015. 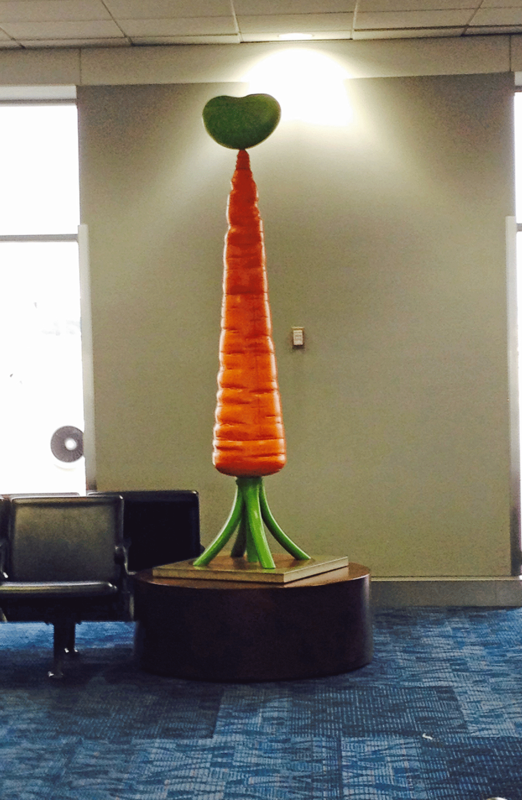 WHY YES — It is a rotating lima bean on a giant carrot. Why do you ask? Taken at ATL, Oct. 24, 2015. One of many feral cats roaming a Virgin Islands vacation resort. This calico came to see if breakfast was ready yet. Feeding and petting the cats was discouraged, though adoption was highly encouraged. Yellow butterfly rests on a fallen oak leaf. Afternoon sun casting long shadows. Pinpoints of light show where insects have chewed holes in the leaves.